Much like their children, parents of teenagers now live in a world that is heavily influenced by digital devices and online platforms. Among parents of 13- to 17-year-olds, 94% own a desktop or laptop computer; 76% own a smartphone; 72% use Facebook; and 84% go online at least occasionally using a smartphone, tablet or other mobile handheld device. (For full details on technology ownership and use among parents of teens, see Appendix A of this report). And as these devices have become more prominent in the lives of parents and teens, many parents are now faced with the challenge of how to effectively monitor their child’s behavior, interactions and time spent in various online spaces. Ultimately, parents today report taking a number of steps to influence their child’s digital behavior, from checking up on what their teen is posting on social media to limiting the amount of time their child spends in front of various screens. Parents of younger teens report they tend to take a more active role in policing their teen’s behavior, but parents of all demographic backgrounds tend to rely more heavily on personal engagement and monitoring than on technological solutions. Parents also generally monitor the digital lives of teen boys and teen girls in similar ways. Parents take a number of different steps to monitor their child’s behavior and interactions in digital spaces, with personal monitoring being the most prominent of these steps. Fully 61% of parents say they have checked which websites their teen has visited, while 60% report checking their teen’s social media profile. Teens are increasingly using mobile technologies to communicate, share and go online ­ and nearly half (48%) of parents say they have looked through the phone call records or messages on their child’s cellphone. On the other hand, parental monitoring by technological means is somewhat less common. Some 39% of parents say they turn to parental controls or other technological tools to block, filter or monitor their teen’s online activities. And even fewer parents report using parental controls to restrict their teen’s use of his or her cellphone (16%) or using monitoring tools on their teen’s cellphone to track his or her location (16%). In total, 84% of parents report taking at least one of these six steps to monitor or restrict their child’s online activities, while 16% indicate that they have not taken any of these actions with their teen. Another 16% say they do one of these activities, while just under half of parents (45%) take between two or three of these actions. Other parents are especially vigilant: 19% have taken four or five of these steps, while 5% indicate that they have taken all six. Regardless of their teen’s age, a majority of parents say they check their child’s web browsing history, yet parents of younger teens are somewhat more likely to do so. Roughly two-thirds (68%) of parents of 13- to 14-year-olds have checked which websites their teen visits, compared with 56% of parents of 15- to 17-year-olds. Parents of younger teens are also more likely to use tech-based tools to block or monitor what their teen does or sees online. Some 46% of parents of younger teens report using parental controls to monitor their child’s online activities, compared with 34% of parents of older teens. On the other hand, parents of older teens are somewhat more likely than parents of younger teens to check up on their teen’s social media profiles (63% vs. 56%). Notably, older teens have higher rates of usage across a range of social media platforms. Overall, parents of older and younger teens are equally likely to say they monitor their child’s mobile behaviors. However, when analyzing parents whose teen currently has a cellphone, a pattern of more intensive monitoring of younger teens emerges. Half (50%) of parents of 13- to 14-year-olds say they look at their teen’s phone call records or messages, similar to the 47% of parents of 15- to 17-year-olds who engage in this behavior. But looking specifically at parents of teen cellphone users, 67% of those whose teen is 13- to 14-years-old say they look at call records or messages on their teen’s phone, compared with 54% of parents of 15- to 17- year-olds. Just as younger teens are more likely to experience certain types of parental monitoring, younger parents are more likely to report taking a number of these actions. Roughly two-thirds (68%) of parents under 45 years of age say they have checked which websites their teen visited, compared with 53% of parents 45 and older. Younger parents are also more likely than their older counterparts to check their teen’s social media profiles (66% vs. 53%); to use parental controls or other technological means of blocking, filtering or monitoring their teen’s online activities (44% vs. 34%); and to look through their teen’s phone call records or messages (55% vs. 41%). Other than parental or child age, there are relatively few demographic differences regarding digital monitoring. Mothers and fathers tend to monitor their teen’s digital behavior in a similar fashion, while the data show few differences in digital monitoring based on race and ethnicity, household income, or educational attainment. Technology plays a central role in the way that teens connect and engage with both friends and romantic partners. Thus, the parental threat to take away digital devices is a potentially potent form of punishment. Indeed, 65% of parents report that they have punished their teen by taking away their teen’s cellphone or internet access. Furthermore, a majority of parents say they place restrictions on their teen’s internet use, regardless of their behavior: 55% of parents say they limit the amount of time or times of day their teen can go online. Parents of younger teens (ages 13-14) are much more likely to say they limit how long or when their teen can go online – 69% have done so, compared with 46% of parents of 15- to 17-year-olds. Still, parents of older and younger teens are equally likely to indicate that they have grounded their teen from using the internet or their cellphone. And as was the case with digital monitoring, younger parents are more likely than older parents to engage in each of these behaviors. Fully 61% of parents under the age of 45 limit the amount of time or times of day their teen can go online, compared with 50% of parents 45 and older. Younger parents are also more likely than older parents to say they have taken away their teen’s cellphone or internet privileges as punishment (68% vs. 61%). Along with monitoring their child’s social media profile in a general sense, many parents take the additional step of actually friending or following their teenage child on Facebook, Twitter or other social media platforms. This behavior is especially common on Facebook, which is the most-used social networking site for parents and teens alike (72% of parents and 71% of teens report that they are Facebook users). Overall, 44% of all parents indicate that they are Facebook friends with their teen. In addition to Facebook, 9% of parents indicate that they follow their child on Twitter, while 17% indicate that they follow their child on some other social networking site. In total, some 56% of parents indicate that they are friends with their teen on Facebook, Twitter and/or some other social media platform. In addition to monitoring their child’s postings or other communications, some parents require their child to provide access to the passwords on their accounts and devices. This behavior is relatively common, but far from universal: 48% of parents say they know the password to their teen’s email account, 43% are privy to their teen’s cellphone password, and 35% know the password to at least one of their teen’s social media accounts. 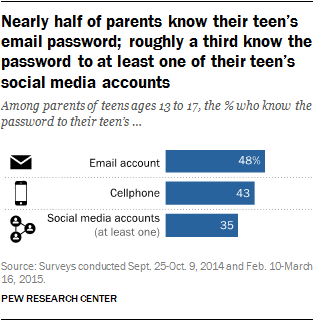 As is true of many digital monitoring behaviors, parents of younger teens are more likely than parents of older teens to have access to their child’s email passwords. Among parents of 13- to 14-year-olds, 54% say they know their child’s email password (compared with 44% of parents of 15- to 17-year-olds). Overall, parents of older and younger teens are equally likely to know their teen’s cellphone password, but, as with checking call records or messages on their teen’s phone, there are differences when specifically looking at only parents of teens who currently have a cellphone. Among parents of teen cellphone users, 61% of parents of teens ages 13 to 14 say they know the password to their teen’s cellphone, compared with 46% of parents of teens ages 15 to 17. There are no difference based on a teen’s age when it comes to parents having the password to one or more of their child’s social media accounts. Younger parents are more likely than older parents to know the passwords to their teen’s cellphone (47% vs. 38%) as well as their social media profiles (41% vs. 29%). There are also some modest differences on this issue based on race and ethnicity as well as educational attainment. White parents are a bit more likely to know their teen’s email account password, compared with Hispanic parents (51% vs. 39%). Similarly, parents who have attended college are more likely than those with no college experience to know their teen’s email password: 54% of parents with some college experience and 50% of college graduates report having their teen’s email account password, compared with 42% of parents with a high school education or less.